The sublingual form of Vitamin B-12 is absorbed through the blood vessels under the tongue & in the cheeks allowing it to bypass digestion and quickly enter into the bloodstream. 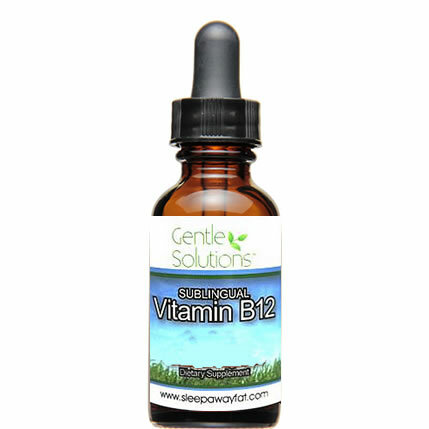 Gentle Solutions is excited to offer our Brand New and Improved Liquid Vitamin B12 complex! What is Liquid Sublingual Vitamin B12 complex? This Liquid supplement contains Vitamins B-2, B-3, B-5, B-6 and B-12. The sublingual form of B-12 is absorbed through the blood vessels under the tongue & in the cheeks allowing it to bypass digestion and quickly enter into the bloodstream. B12 is chemically known as Cyanocobalamin which is the most complex of all vitamins. B12 is a water-soluble vitamin and is one of the vital nutrients our bodies need in order to work properly. It is necessary to perform many of the body’s more important tasks, including the making of DNA during cell division and the healthy formation of red blood cells. Red blood cells are also responsible for producing hemoglobin, the part of the blood that take oxygen from the lungs and transport it to all the different parts of the body. B12 is known as the ‘energy vitamin’ because it gives a real energy boost. It is used to remedy fatigue and speed up the metabolism. Together these B vitamins fight fatigue, aide energy levels, help to lower cholesterol, maintain healthy skin and vision, decrease heart disease and protect against stroke, high blood pressure and many forms of cancer. How will Vitamin B12 complex induce Weight Loss? B12 causes the metabolism to speed up by converting carbohydrates into glucose in the body, this leads to a decrease in fatigue and lethargy and an increase in energy production in the body. This in turn increases weight loss. B12 can help people to maintain a healthier diet and motivate them to exercise and increase physical activity. B12 also helps to fight stress and depression symptoms which are sometimes associated with weight gain. Why do you need B12 complex supplements? The highest levels of B12 are found mostly in animal organ meat. People who practice a vegetarian or vegan diet must obtain all their B12 vitamins thought supplements. High levels of B12 is found in liver and other organs, however a lot of people avoid organ meat. There are smaller traces of B12 found in shellfish, milk and eggs. Most people are simply not obtaining enough B12 in their diet. Why B12 Sublingual Vitamins instead of B12 injections or Capsules? Vitamin B12 is not of the vitamins the body can store and use later. Injections would have to be done regularly to obtain a constant balance of B12 in the body. Injections can be painful and scar tissue can develop at the injection site. Injections can be fairly costly as well. The average price is $65.00 per injection, which should be done about once or twice a week to maintain a healthy balance in Vitamin B12 in the body. Taking Sublingual Vitamin B12 once or twice daily can be more effective than injections. The sublingual form of B-12 is absorbed through the blood vessels under the tongue & in the cheeks allowing it to bypass digestion and quickly enter into the bloodstream acting quicker than capsules. Digesting a daily steady flow of vitamin B12 in your body will allow increased metabolism and consistant energy levels that will not spike and decrease as the shot wears off. Increased intake of Stearic Acid & Vitamins B-12 can reduce blood levels of homocysteine, an amino acid associated with an increased risk of developing Alzheimer's Disease & Heart Disease. Simply place one full dropper under the tongue and hold there for 20 seconds before swallowing. I love these B12 Vitamins. I have tried others in the past that were chalky and tasted horrible. These B12 taste great! I always notice a difference when I am taking B12. I am not as hungry and I feel much more energized. I am not sure if it’s the B12 that helps me lose weight or if its how much more active I am when I take it but either way it has helped me lose an extra 12 pounds in the past 2 months. So worth the money!! I bought a cheaper B12 vitamin for my dad from Wal-Mart, he complained about the taste. Then I heard about this B12 from Chris on Q102 & got them for my dad. He said they tasted good and he was correct. They have a sweet/tart taste. If you have to take a vitamin, why not a tasty one? And if you compare labels too…Gentle Solutions has more mcg per serving and there’s more capsule in a bottle, so over all it’s a better deal!